2. 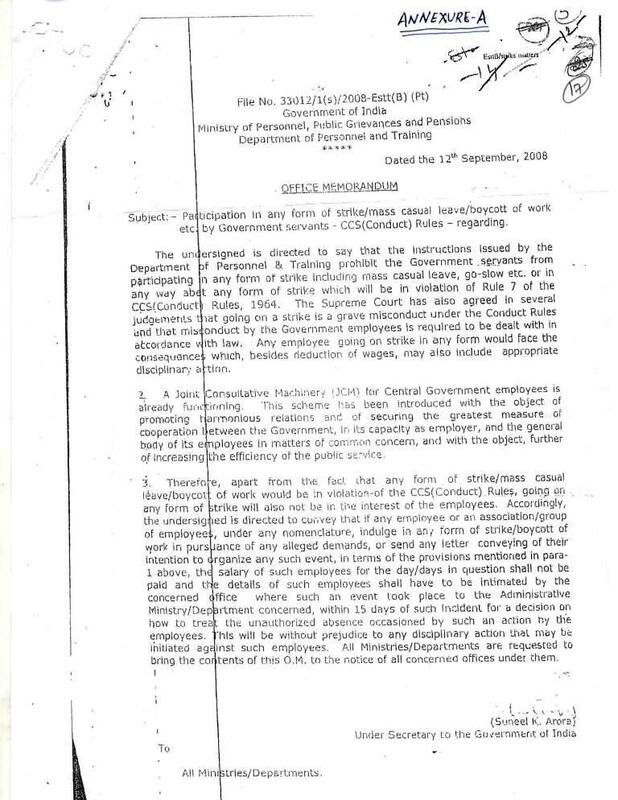 The instructions issued by the Department of Personnel and Training prohibit the Government servants from participating in any form of strike including mass casual leave, go slow etc. or any action that abet any form of strike in violation of Rule 7 of the CCS (Conduct) Rules, 1964. Besides, in accordance with the proviso to Rule 17(I) of the Fundamental Rules, pay and allowances is not admissible to an employee for his absence from duty without any authority. As to the concomitant rights of an Association after it is formed, they cannot be different from the rights which can be claimed by the individual members of which the Association is composed. It follows that the right to form an Association does not include any guaranteed right to strike. 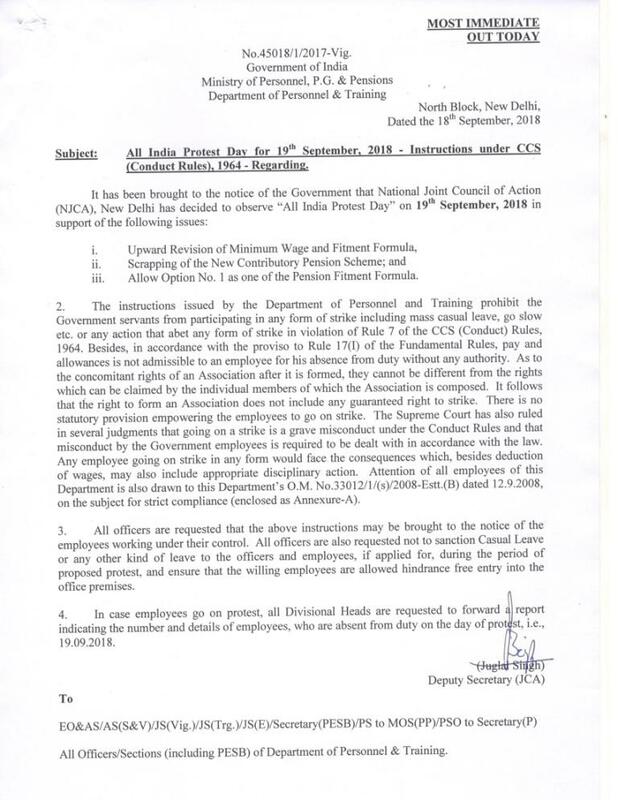 There is no statutory provision empowering the employees to go on strike. The Supreme Court has also ruled in several judgments that going on a strike is a grave misconduct under the Conduct Rules and that misconduct by the Government employees is required to be dealt with in accordance with the law. Any employee going on strike in any form would face the consequences which, besides deduction of wages, may also include appropriate disciplinary action. Attention of all employees of this Department is also drawn to this Department’s O.M. No.33012/1/(s)/2008-Estt. (B) dated 12.9.2008, on the subject for strict compliance (enclosed as Annexure-A). 4. 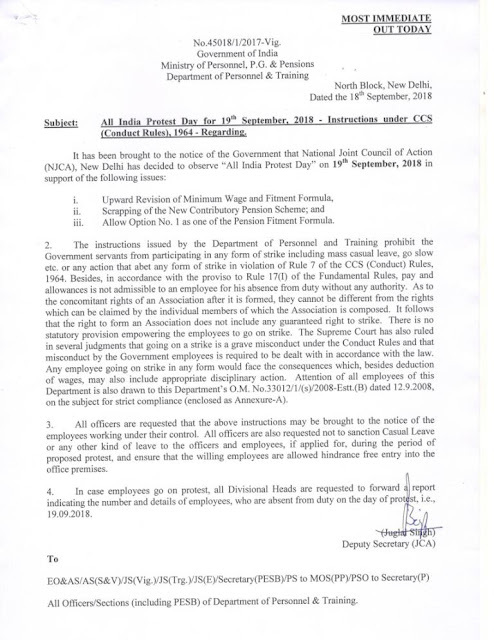 In case employees go on protest, all Divisional Heads are requested to forward report indicating the number and details of employees, who are absent from duty on the day of protest, i.e., 19.09.2018.